The classes are very beneficial for those who are already doing, or who are thinking about doing GCSE Art. They will be mixing with children/teenagers of a similar age and it offers them a balance of – self discipline, improving & learning technical skills, freedom of expression & experimentation. 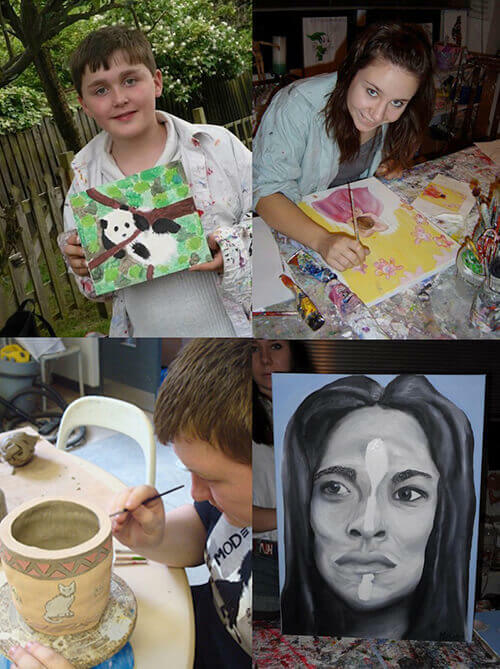 The classes include – structured observational drawing practice & freedom of expression activities!. Drawing practice & technical drawing skills are invaluable for GCSE Art, A level Art and degree courses, plus many creative, design & illustrative career choices. Pupils have a choice of using pencils, charcoal, pastels & chalks to draw with & lessons include: perspective, tone, texture, composition, colour, edges & spaces, proportion, scales, angles. Drawing homework is also set every week to help pupils build up their drawing skills & confidence. During the lessons where freedom of expression is the topic, children are encouraged to express themselves freely, be imaginative, & responsible for their own choice of themes, activities & materials. Materials available include: paint – water colours, oils, acrylics, clay, mod rock, fabrics, coloured paper & card, plaster of paris, inks, wire & mosaic tiles.